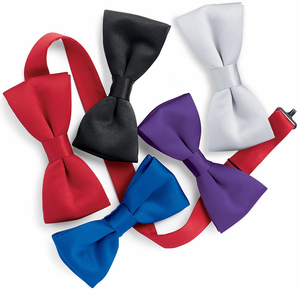 Our Vangard Adjustable Bow Tie is made in a washable satin. The adjustability of this tie means you get the perfect, comfortable fit every time. No fumbling with tying the bow right, just wrap the band around, clasp it closed and go! Looking for a classic vest to pair with your new bow tie? Try our Men's 5 Button Poplin Vest that will go great with any of the colors offered here, or try the Men's Vangard Satin Vest that matches this black bow tie. We currently do not offer a cummerbund that matches this bow tie.